he brushless motor delivers up to 57% more run time over brushed. Ultra compact, lightweight design allows use in confined spaces making this unit a favourite of many trades including kitchen fitters. Compact (7.8in front to back), lightweight (1.62kg) design fits into tight areas. Two speed all metal transmission increases runtime and provides a longer tool life. 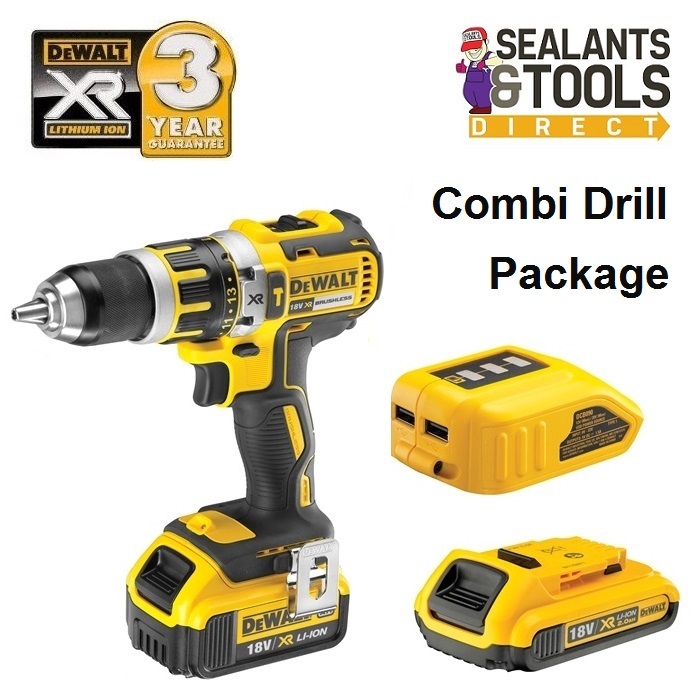 This high specification cordless 18 volt combination Combi drill from DeWalt offers the professional user excellent performance and has an impressive specification. It is powered by the latest technology Lithium Ion (Li-Ion) batteries that are much lighter than Ni-Cad batteries and hold their charge for weeks when not in use. 1 x Staker Carry Case. Also supplied is a USB charger, which transforms your battery into a portable charger for up to 2 USB devices. Capacity: Wood: 38mm, Steel: 13mm, Masonry: 13mm. The Combi Drill gets its name from the ability to perform a number of applications. It enables the user to perform normal drilling tasks in materials such as metal, wood and plastic, as well as hammer drilling in masonry. It also has 14 torque settings which enables you to use it as a screwdriver and pre-set the pressure (torque) at which the screw is put in so as not to damage delicate materials such as plasterboard. This hi-tech machine has the powerful DeWalt XR motor and can generate a hefty 60Nm of torque. It has a keyless chuck, 2 variable speeds, forward and reverse action, and a trigger activated job light. There is also a sturdy metal belt clip and the handle has a larger rubberized zone for extra user comfort and control.